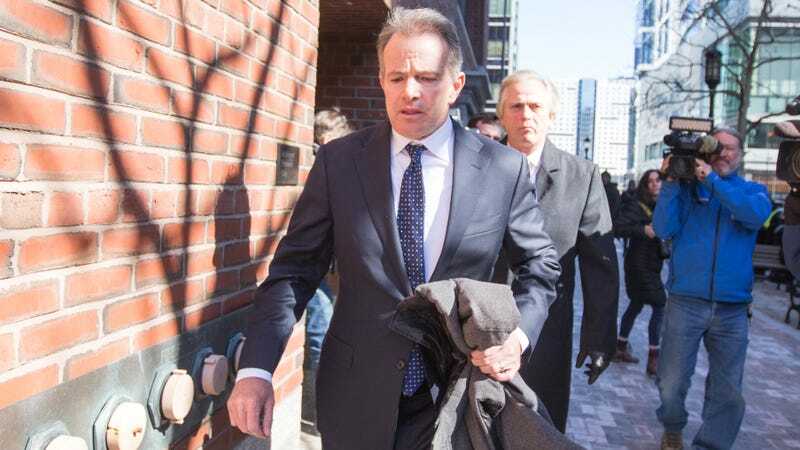 Gordon Ernst, former head coach of the men’s and women’s tennis teams at Georgetown University leaves following his arraignment at Boston Federal Court on March 25, 2019 in Boston, Massachusetts. The scandal may have held our interest thanks to the involvement of celebrities like Lori Loughlin and Felicity Huffman, but its scope also, of course, extends to more run-of-the-mill rich people who sought to get their kids into top-tier schools through a sprawling bribery scheme concocted by college admissions consultant William “Rick” Singer. Earlier this month, it was revealed that one client paid Singer $6.5 million, though it’s unclear who that was. At one end of the spectrum of those charged was Gordon Ernst, the former head tennis coach at Georgetown University, who has been accused of taking $2.7 million in bribes from Mr. Singer to designate at least 12 applicants as recruits to the tennis team. Prosecutors are seeking forfeiture of Mr. Ernst’s country club membership and a second home in Cape Cod, among other assets. Mr. Ernst appeared in court on Monday flanked by two prominent defense lawyers. At the other end was Lisa “Niki” Williams, an assistant teacher at a Houston high school who prosecutors say took bribes — the indictment cites one in the amount of $5,000 — in exchange for allowing cheating on the college entrance exams. The judge noted that Ms. Williams, who entered her plea in a voice barely above a whisper, had qualified for a court-appointed lawyer. Others who appeared on Monday included various coaches (and the former senior associate athletic director) at USC, as well as coaches from UCLA and Wake Forest. On the non-athletic side, there were also several people allegedly tasked with arranging and funneling the bribe money. Two defendants—a soccer coach at Yale and someone who allegedly took SAT and ACT exams for college applicants—have pleaded guilty. More hearings are scheduled for later this week, so it’s nice that we have that to look forward to.